i didn’t finish the book. i can’t say that about many books, but this one? heck, i didn’t even make through the first 100 pages. i only reached page 69 (tee hee) and i can’t even remember the main character’s name. (ok, it’s kathy. i peeked.) 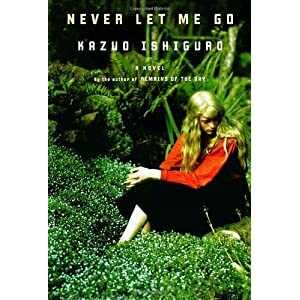 i found the prose to be dull and lifeless and vague and confusing and i see from an amazon.com review that “misdirection” is an intended side effect, but ishiguro misdirected me right out of the book. i couldn’t get into it nor did i want to. the only reason i made it as far as i did was because of the external pressure i felt knowing others in my group were reading it, but there are far too many other books out there for me to waste my time on a book that i find unrelatable and uninteresting. i know, i know, i’ve said that reading all kinds of books (even bad ones) is important because from them you learn what to do and what not to do in your own writing. it looks mildly entertaining, slightly creepy, but ultimately watchable, right? so what am i missing? why aren’t the words beckoning like usual? am i right to have given up so soon? should i have incurred the library fine and kept reading? what do you do when you find yourself reluctant to read? do you plod ahead? do other chores? put down the book for good? watch the movie instead? in other reading news, these are the books i read instead of the book club selection: WHITE CAT by holly black, REVOLUTION by jennifer donnelley, and NORTH OF BEAUTIFUL by justina chen headley. all of which had action and drama and real life moments that punch you in the gut. 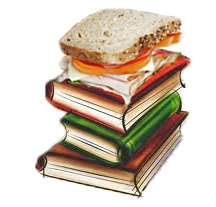 yes, i want to be slugged while reading. emotionally socked. aww, you know what i mean. and i know that next month’s book (13 REASONS WHY by jay asher) will provide the punch. why? because i’ve already read it. This entry was posted on January 20, 2011 at 8:00 am and is filed under book club. You can follow any responses to this entry through the RSS 2.0 feed. You can leave a response, or trackback from your own site. My friend Kevin loves that book and loved the movie adaptation as well. He said it was very depressing, a kind of depressing with no hope which is why I’ve skipped it altogether. depressing with no hope? yeah, glad i skipped this one. i’m okay with depressing as long as it has a side of hope. no hope? no me reading it. I couldn’t get through Revolution, though it sounded right up my alley. I loved North of Beautiful. Made me want to take up geocaching! what the hell is geocaching??? Abby, good for you for giving up on it! Life is too short to waste on books that don’t speak to us. Let me know when/if you read it! pebbsie — if you do finish NEVER LET ME GO, let me know. i’m curious to hear if you like it. i’m actually not quite yet finished with REVOLUTION. i am really liking it. it was a bit slow to start, but once she finds the diary, the book races on. and YES, i totally want to take up geocaching now. i loved NORTH OF BEAUTIFUL so much though the dad really creeped me out. adriana – geocaching is where objects are hidden all over the world and all you’re given is a set of coordinates (and sometimes a clue) to help you find it. once found, you sign the paper and then add another object to the bundle, you leave a piece of you behind. very cool concept. Oh, that might be why. I read 20 pages or so and gave up. Hrm. Maybe I’ll pick it up in the summer…. yes, give it another whirl. p.s. i LOVE LOVE LOVE that you and adriana have a separate convo going on here on my blog. ok, that geocaching business sounds disturbing. “you leave a piece of you behind”? um… no, thanks. whoops, it wasn’t meant to be disturbing. geocaching is cool, not freaky. not disturbing! you can leave little tchotchkes, pages from a book, a ring, a rock, whatevs you want (I think). it’s a real thing, right? cause i want to try it. Turtley! Lisa’s old roommate would geocache with her boyfriend. I wanna do it too. If you do it, I’ll do it! Or we could not do it together but then talk about it after. i’m horribly directionally challenged so i’ll need your help. i do kind of love that vanessa picked a book she hadn’t read because it’s fun (and funny) that we all dove into this with no clue what to expect. haha, brain twins. i am okay with that. i have a lot to learn from you. Me too. There really are too many other books out there that I WANT to read than for force myself to sit through one that actually bored me to tears. what you said is a recent revelation in my life. it’s kind of liberating, but sometimes i worry i give up too soon on a book. like REVOLUTION. if it hadn’t been personally recommended to me, i might not have stuck with it. i’m glad i did though because it’s fascinating. however, i think NEVER LET ME GO was never going to be good, at least, according to my tastes. I agree, in fact, this is one book I will have no problem letting go of. it’s a new sensation for me, but yes, i agree. no problem here putting this book down. I didn’t read any of your alternative books, or I’d be happy to engage in a discussion. I really really do mean to read next month’s though. I swear! Ok, well, what did you love about it?!? So true! One week from today!!! By which I mean I’m pretty pumped. Never Let Me Go has been on my wishlist for a while, but I’ve never gotten around to picking it up! Sounds like I haven’t missed much, though. And North Of Beautiful? One of my all-time favorite novels. Totally under-recognized and under-appreciated. Glad to see you loved it, too! there are a few people who piped up and said they loved NEVER LET ME GO. with such a wide range of books available, there’s bound to be some i like and don’t like. this fell into the latter category for me. and yes, NORTH OF BEAUTIFUL was gorgeous. i first heard of it because of the jacket image, actually. two publishers used that same photo on books that came out the same year. it took me until now to finally read it. i am so glad i did!